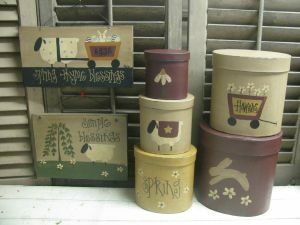 Primitive Spring Time Set of 5 Tall Oval Stacking Boxes. Once featured in the Country Sampler Magazine. 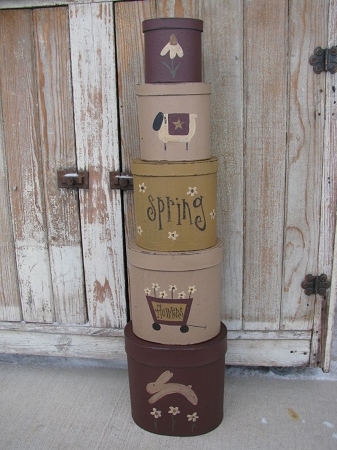 This spring inspired set of stack boxes are perfect to accent your spring decor. 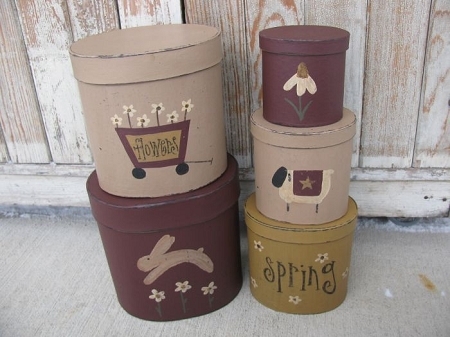 The designs include a bunny leaping over daisies, wagon full of daisies, the saying Spring surrounded by daisy heads, a sheep with a quilt on, and a single stemmed daisy. The colors include burgundy, teddy bear tan, which looks like a nice creamy yellow tan (the picture casts this brighter than it really is, and khaki tan. The set of 5 measures 31" tall when stacked together and the biggest box is 8". Hand painted on paper mache, sanded and antiqued. Hand painted, designed and signed by Heidi.